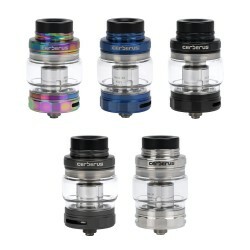 GeekVape SUPERMESH 5pk CoilsThe SUPERMESH coil system, designed for the Shield Tank, Aero Tank, and&..
GeekVape Cerberus Sub-Ohm TankThe Cerberus is a 27mm sub-ohm tank with a 5.5mL e-juice capacity from..
GeekVape Cerberus Replacement 5.5mL Bubble GlassHandy replacement bubble glass for the Cerberus Sub-.. The Aegis Solo from GeekVape is a compact version of the original Aegis, it is smaller, lighter and more durable. Powered with the Latest AS-100 Chipset that has incredible accuracy and stable power output, the Aegis Solo is able to produce up to 100W power with a single 18650 battery. Latest AS-100 chipset provides an incredible accuracy & stable power output, faster response time, and supports precise temperature control for Stainless Steel, Nickel 200 and Titanium. First grade safety features include... 10 second cut-off protection, short circuit protection, over charging and discharging protection, over-heat protection, over-current protection, and anti-dry protection (temperature control mode only). IP67 water, shock, and dust protections - worry free rains or dropping by accident. IP67 Waterproof - able to withstand immersion for up to 30 minutes at a depth of up to 1 meter. Shockproof - shock resistant, no need to worry about breaking by accident! 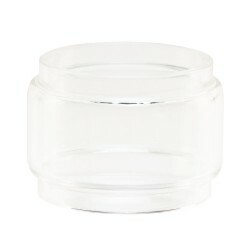 Dustproof IP67 - able to withstand dirty environments and can be easily cleaned. Powers up to 100W with a single 18650 battery! Included in the kit is the Cerberus sub ohm tank which is optimized by the ultimate Super Mesh coil that maximizes heating contact surface area in order to provide maximum flavor and large vapor production. Super Mesh Coils are compatible with Aero Mesh tank and Cerberus tank.